That’s just stunning and so perfect for summer. Your pictures, and food, are always so fresh and colorful. Don’t you love a recipe coming together from fridge “leftovers”? This one looks terrific! Loved the concept! Sometimes I do a “harvest frittata”, in which everything gets mixed with a few beaten eggs and into a skillet it goes… but never attempted the same with soup. Great move! This is beautiful. I just love how this uses pre-roasted chicken (think leftovers!). Lynda love the colors on the soup. And that is great idea to make use of left overs. I kind of do the same, but I convert them into my mom’s beggar curry or stew. Tortilla soup is one of my favorites, especially when the consistency isn’t too thick. I prefer the brothy type because it’s not as fattening with all of the cheese, cream, etc. Love how healthy this is! Beautiful &. 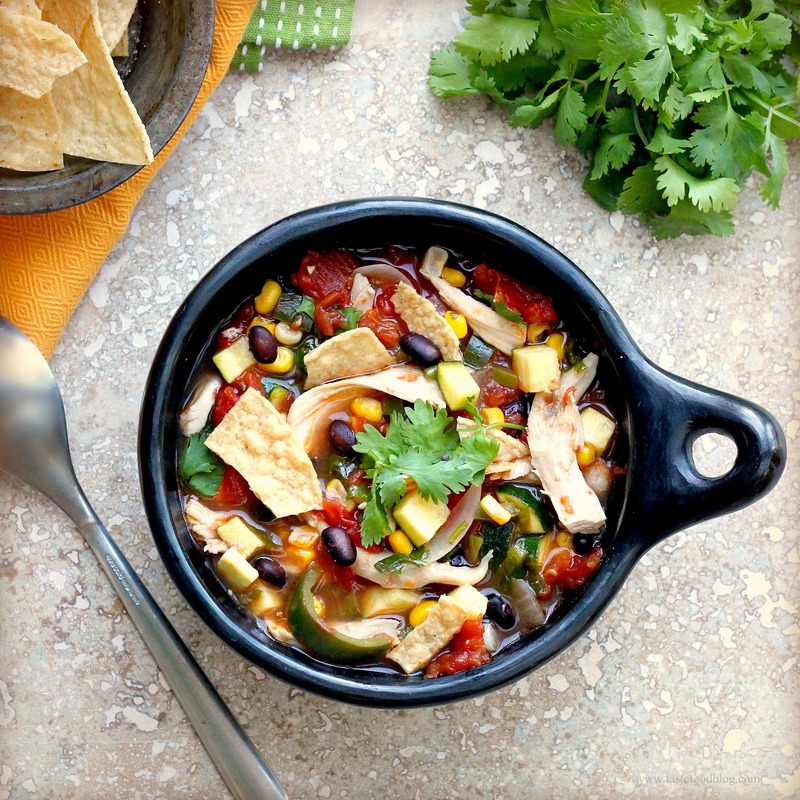 Colorful looking soup…love the combo of tortillas,chicken & veggies..YUM! This is perfect. Chicken tortilla soup is my favorite. I am saving this recipe for sometime around October, and then I am going to eat the heck out of it. whatever the reason could be, you sure did made a delicious soup and it looks so colorful too! I made this soup tonight….oh so delicious! Thank you! It’s been very hot here in NC but I’ve been eating raw salads for a few weeks for my lunches and I needed a change, but still wanted healthy, homemade and low cal. This fits the bill! Made this dish tonight from my girlfriends and it was absolutely delicious! Cannot wait to make it again! Thank you! Just made this – it was AMAZING!! Or, should I say my boyfriend made it and surprised me when I came home from work, think I’m going to have to do a re-blog here. Made this yesterday for Valentine’s Day for the girlfriend and it was delicious. The peppers leave a good lingering spice in your mouth. I did a crock pot variation in order to cook and shred the chicken first with the tomatoes, black beans, a bit of the spices, and some chicken stock. Cilantro is a great touch and we added some shredded colby-jack cheese and ate with blue corn tortilla chips. This recipe made a LOT of great, thick soup that we’ll probably be eating for the next week.